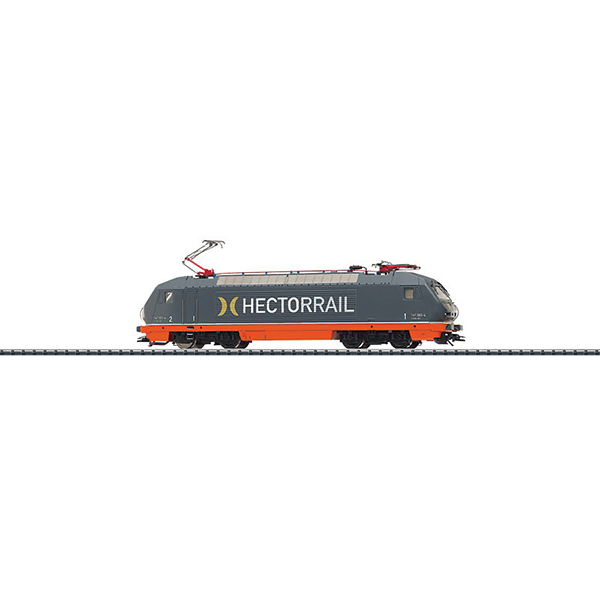 Prototype: Swedish privately owned railroad "Hectorrail" class Litt. 141 express locomotive. Former Austrian Federal Railways (ÖBB) class 1012. Built in 1997 by SGP, ELIN, and Siemens as a series of 3 prototypes. Road number 141.003-4 Starling. Use: Freight trains. Model: Era VI. The frame is constructed of die-cast metal. The locomotive has a 21-pin digital connector. It also has a 5-pole motor with a skewed armature and a flywheel, centrally mounted. 4 axles powered through cardan shafts. The headlights are maintenance-free, warm white LEDs, and they will work in conventional operation. When a 66849 decoder has been installed in the locomotive, the normal and long-distance headlights can be controlled digitally. The locomotive has separately applied grab irons and many other details. The roof has detailed equipment. The engineer's cabs have interior details, and the front one has a figure of a locomotive engineer. The locomotive has NEM coupler pockets with a guide mechanism. The couplers can be replaced by close end skirting. Brake hoses can be mounted on the locomotive. Length over the buffers 222 mm / 8-3/4.